On January 20th 2017, the Consul of Italy, Dr. Maria Luisa Lapresa, met with Brian J. Whiston, Superintended of Education for the State of Michigan for the official signing of a Memorandum of Understanding designed to facilitate the promotion of the Italian language in K-12 schools in Michigan. The official document, believed to be the first of its kind between the Italian government and a Department of Education of a State in U.S.A., will allow individuals with a degree from an Italian University to teach in K-12 schools in Michigan by receiving a temporary teaching permit from the Office of Certification in Lansing. This important milestone, which is designed to address the possible imminent need for certified and qualified teachers of the Italian language, was made possible thanks to the efforts and numerous meetings and discussions between Consul Lapresa, Superintendent Whiston and his staff of the Department of Education in Lansing, members of the Osservatorio della Lingua Italiana, and past Representative Anthony Forlini. Il 20 gennaio 2017, il Console Maria Luisa Lapresa ha firmato un protocollo d’intesa con il Dipartimento dell’Istruzione dello Stato del Michigan a sostegno dell’insegnamento dell’italiano nelle scuole pubbliche dello Stato. 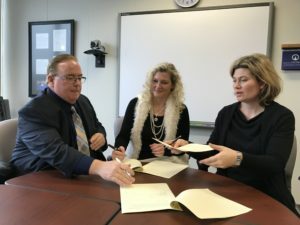 In particolare, l’obiettivo di questo accordo, firmato dallo State Superintendent Brian J. Whiston e da Krista Ried dell’Office of Professional Preparation Services, è quello di favorire l’inserimento di docenti italiani, già abilitati in Italia, all’insegnamento nei distretti scolastici del Michigan. Il protocollo d’intesa è il risultato di trattative e incontri tra i rappresentanti del Dipartimento dell’Istruzione, i membri dell’Osservatorio della Lingua Italiana e il Console Lapresa. Alla firma del protocollo d’intesa erano presenti anche l’ex State Representative Anthony Forlini, la presidente della Società Dante Alighieri del Michigan Lia Adelfi, il dott. Paolo Nervo e il Prof. Franco Iaderosa, rispettivamente Presidente e Direttore Didattico dell’Ente Gestore NOI Foundation. Present at the signing of the MOU were (seated L-R): State Superintendent Brian J. Whiston, Krista Ried, Office of Professional Preparation Services, Maria Luisa Lapresa, Consul of Italy Standing (L-R): Franco Iaderosa, Director of NOI Foundation, State Representative Anthony Forlini, Paolo Nervo, President NOI ,and Lia Adelfi, President of Dante Alighieri Society of Michigan.